The ultimate source of La Peche is a design by Jean Pillement from a series, Livre de Chinois, published in London in 1758 and engraved by P.C. Canot. Later, in the second edition of The Ladies Amusement, published about 1760, the design (as shown here) appeared on a page of chinoiserie figure subjects, signed J June sculp. for John June, the engraver. This is perhaps the direct source. The other side of the mug. 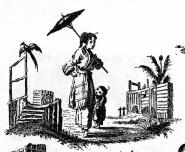 This is La Promenade Chinoise as it appears on the same page of chinoiserie figure subjects in The Ladies Amusement. The inscription. For a discussion of other Worcester mugs with similar inscriptions and information about the Izod family see Aileen Dawson The Art of Worcester Porcelain (2007) p192. 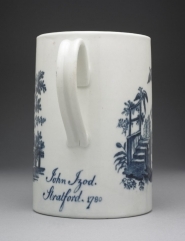 This Worcester mug is inscribed and dated 1780 below the handle. It has a printed crescent mark and bears two underglaze blue chinoiserie prints: La Peche (seen here) and La Promenade Chinoise (on the other side). These prints are invariably found together on mugs. More rarely, mugs with these prints in overglaze black are found. 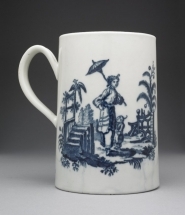 There was an example in the Handley Collection, see his 18th Century English Transfer-Printed Porcelain item 4.2. Very similar prints are found on Caughley blue and white porcelain. If unmarked these can only be distinguished from Worcester examples by careful examination. See G Godden Caughley and Worcester Porcelain pp 133-4.